North Wales was an area rich in tramway schemes but poor in actual lines. Of the few that were constructed, probably the most famous is the Great Orme Tramway, if only for the reason that it still operates today. 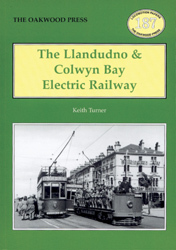 The second most famous, and undoubtedly of more interest too the tramway enthusiast, was on that also served Llandudno: the Llandudno & Colwyn Bay Electric Railway. Despite its title it was a tramway, not a railway, and of all of the north Wales tramways it had the longest route mileage, the largest car fleet and, at the outset, the greatest problems. How it overcame those, and what happened thereafter, is the subject matter of this book. This account was originally based on the relevant sections of the author’s North Wales Tramways, published in 1979. For this history the opportunity has been taken to expand the narrative at several points where further information has come to light, to increase greatly the number of photographs and, where relevant, to bring the story up to date. A5 format, 160 pages, 200 illustrations.